For many people, kids and adults, video games offer a respite from the drudgery of daily life. Escaping into the video game realm allows players to forget about the bad test score, the angry bosses and the looming laundry. Since both young and old can enjoy gaming, finding a video game that appeals to the whole family is beneficial. The new Moto Racer 4 offers young, old and everyone in between the chance to race to the finish line. Released on January 24, Moto Racer 4 is available for download in Xbox One and PS4 formats. The game retails for approximately $39.99. The new Moto Racer 4 brings back a popular motorbike racing game series. Since most people won’t be able to race a real motorbike, this game hopes to bring the thrill and excitement to the gaming world. From powerful road bikes to agile dirt bikes, players can test their racing ability in various environments. While this game offers both single and multi-player options, the key to success is risk versus reward. Moto Racer 4 rewards players for taking big risks. For accomplishing big jumps, higher speeds and insane moves, the player received more points. These points can be used for customization. 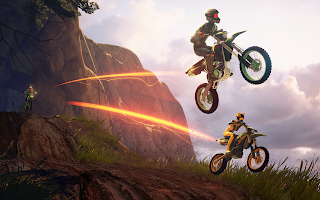 While the jump may seem impossible (and in real life never attainable), repetition and skill bring reap the ultimate rewards in Moto Racer 4. 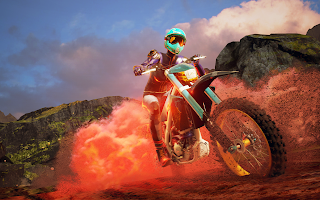 Moto Racer 4 offers both a single player and a multi-player option. Even though players aren’t seated on simulated motorbikes like in an arcade, the detailed graphics and side by side play in the multi-player option create a racing atmosphere. From better turns for racing position to faster speed to attain longer jumps, players can feel immersed into the racing environment even while sitting on the couch. Recently, my family had the opportunity to play the Moto Racer 4 game. While I personally am not as adept at playing video games as my children, I found the game relatively easy to play. Personally, I like the individual challenge games, like the time trial. For the kids, the boys loved the high speed crashes and extreme thrills of the game. Aerial maneuvers, attaining 185 miles per hour, and the racing challenges were the kids’ favorites. The boys definitely wanted more of the need for speed. For fans of racing games, the new Moto Racer 4 is a good addition to the family’s gaming library. It offers a good alternative to car racing games. The video game is rated E for everyone. The game can be purchased on Amazon or downloaded directly from the video game platforms. Disclosure: The writer received this game via download to facilitate this writing. All opinions are my own and were not influenced by any person or entity. I'm not a big player of video games, but this game sounds like one the guys in my family would all love! Sounds like a fun game. My hubs and son would have a blast with it I'm sure! Sounds like a really great game. I know it will go well with those young boys who love cars and games that involve driving. Seems pretty cool. My boys would love this game! They love any game that lets them drive and race. That would take lots of practice to master. It sounds like a great challenge! Motorbike games have ended up to some degree a wrath with affirmed gamers. Some portion of this may well be a direct result of the enhanced design, activity, and sound that is presently accessible through glimmer play. The situations can look exceptionally practical with these changes. Gamedesire . I through enjoyed playing Fallout 4 and overcoming the challenges with great passion. It was one of the best gaming experiences I ever had.